An estimated 200,000 miners in South Wales go on strike over higher pay. 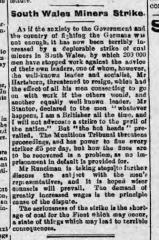 Coal was very important to the war effort so David Lloyd George was sent to Cardiff to try to negotiate with them. The miners accepted a new government offer and returned to work a few days after.